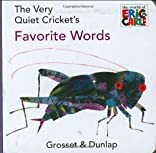 Learning first words is Very simple and fun with Eric Carle! This mini board book shows ten images and ten easy words from one of Eric Carle's classic Very books. First-time readers will love to learn words such as flower, moon, grass, turtle, and foot.